Beethoven's 7th string quartet, Opus 59, No.1 ("Razumovsky" 1) has always been one of my favorites. Composed at the height of his "heroic" phase, this quartet takes many chances and always lands on its feet. Despite the fact that it actually "offended" a few early performers, now it's one of the bedrocks of the string quartet repertoire. 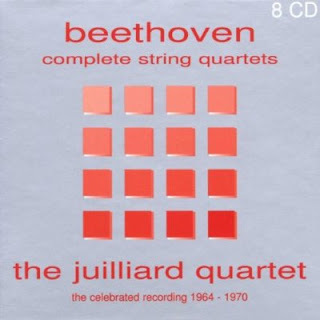 Here's the Juilliard Quartet in a performance from 1975. Polling in Bavaria in 1975, at the beautiful baroque library of the former Augustinian Monastery to the south-west of Munich. More about String Quartet 7 in a previous post HERE. The 3 Razumovsky Quartets are actually my favorite Beethoven quartets of all - I like them even more than the late ones. They are just perfect works of his middle-period style. I find it interesting that the first and third of the set seem to mirror in style the symphonies closest to them, with 59.1 having a sort of Eroica feel, and 59.3 more in the style of the 4th Symphony. The analogy with the ERoica and the 4th S. is an interesting idea - I'll have to keep that in mind next time - thx!